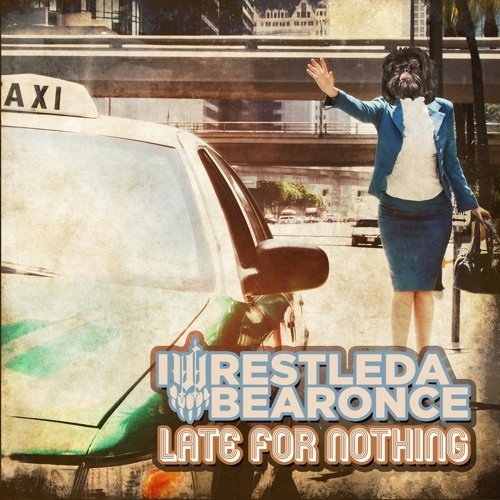 If you aren’t already aware of how crazy Iwrestledabearonce sound then ‘Late For Nothing’ is going to seriously surprise you. If you are familiar with the American band then chances are, well, it’s still going to surprise you. It continues to push barriers and expand the bands musical scope, with ‘Late For Nothing’ being yet another step in the right direction. The release mainly consist of manic metalcore, with the odd electronic influence thrown in for good measure. Unlike past releases the use of electronics contribute more so, and no longer act as fillers. The album lacks any real interludes, and is a lot more technical as a result, replacing the random odd segments found on tracks such as ‘Deodorant Can’t Fix Ugly’ found on the bands last album. As a result, ‘Late For Nothing’ is a lot more structured and concise, meaning it forces itself to be taken more seriously, despite still being a fun and chaotic release. It loses some of the Iwrestledabearonce uniqueness but replaces it with a more streamlined sound. Another beneficial addition is Courtney LaPlante, whose vocal styling doesn’t differ massively from Krysta Cameron’s, but are superior in a sense. LaPlante focuses on a more melodic delivery, making for soaring choruses, which sit well with the bands more traditional approach to song writing. Her guttural roars are very similar to Cameron’s and she slips very easily into the ex-vocalists shoes. She doesn’t bring a massive change in sound, which will suit fans, but what she does add is definitely for the better. Vocal strength is shown most clearly on ‘Boat Paddle’, which displays LaPlante’s excellent range and talent. The songs featured here are generally very good, combining trademark Iwrestledabearonce with these new elements mentioned above, and the result is songs such as opener ‘Thunder Chunky’ which melds dual clean and heavy vocals, riding along the top of thundering riffs and surging drums. It relaxes only briefly to display catchy bass, before ending ferociously. It signals the start of a sensory onslaught that never rarely relents over the albums 38 minute length. The album has a mix of sounds, merging moments of monstrosity and melody. It’s a very cool sound, mixing a variety of influences. The middle of ‘Firebees’ is almost pop whilst ‘Carnage Asada’ is purely savage and face melting. ‘That’s A Horse Of A Different Color’ is, in my opinion, the albums best tracks, being structured whilst still being frantic and energetic. The chorus is exhilarating and the instrumentals are some of the best the album contains. The albums only real ‘filler’ in a sense is ‘Mind The Gap’ which begins as a tech interlude strangely out of place before evolving into a prog-rock song, featuring solely clean vocals. It seems like an odd addition to the album, but is welcome as it does offer diversity. Speaking of diversity, this is where my main issue arises. If I have one criticism of ‘Late For Nothing’ it is that by the end it becomes a little stale and literally ‘chugs’ along. The songs are still of excellent quality, but the majority of the sound is explored in the first half of the album, meaning ‘Late For Nothing’ becomes a little repetitive in the closing tracks. However, ‘Late For Nothing’ still proves that Iwrestledabearonce are still one of the most exciting / best metal bands around, and is (for the most part) an essential release. It’s fresh and invigorating, and shows clear progression, bringing in new elements to make for a much clearer and efficient sound, that shows musical maturation. ‘Late For Nothing’ is by no means the years best metal release, but is definitely one of the most interesting.